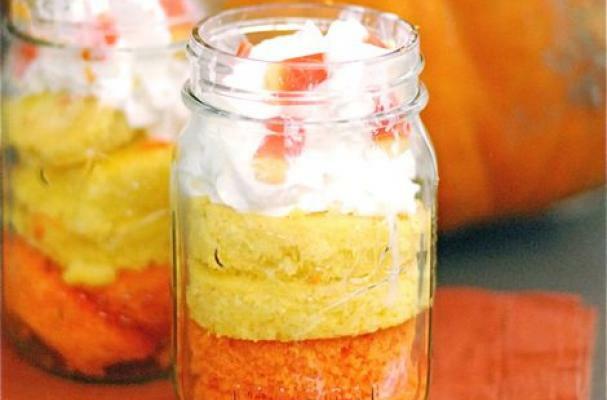 This colorful candy corn cake in a jar from babble.com is a great Halloween project to do with the kids. It only requires a couple of jars, white cake mix, and some food coloring. If you are attending a Halloween party, participating in a bake sale, or just want to do something festive and fun, this candy corn cake is perfect to make. 1. Prepare the cake according to package directions. Divide the batter between two bowls and add some yellow food paste to one bowl and orange food paste to the other. 2. Bake the cake in separate 8 inch round cake pans and allow to cool completely. 3. Use the jar lids to cut out circles in each cake and place the cake in a rounds into the jars and top each with a dollop of frosting. There should be enough cake to fill 4 jars with two rounds of each color. Enjoy!